Join us for a showing of Goosebumps 2 (Rated PG). Bring a comfy chair or blanket, soda, drink boxes or bottled water with a lid and a snack, and enjoy the show! 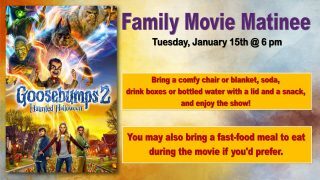 You may also bring a fast-food meal to eat during the movie if you’d prefer. Registration is not required. All ages welcome!